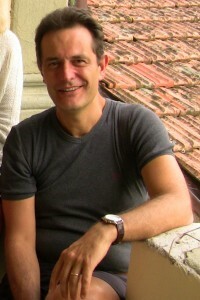 Maurizio Ascari is a senior lecturer and researcher in English Literature at Bologna University. He has had many articles and books on English-language writers published, including Henry James and Katherine Mansfield, and his book, A Counter-History of Crime Fiction was short-listed in the ‘Best Critical/Biographical’ category for the Mystery Writers of America’s Edgar Awards. Faded Letters is his first creative work. While some books are pre-conceived by an author who is in control, drawing diagrams and mastering chronology (detective stories possibly fall into this category), others grow ‘organically’ from a seed. There are stories that need to be told and start haunting the author, who is obsessed with them. Writing becomes a sort of shamanic ritual, an out-of-body experience. Things are hazy, but then suddenly one’s imagination is gripped by powerful forces. The drive to write is compelling. This is how I felt when I entered a café, on my way to a meeting or to my office, and spent ten minutes writing on every bit of paper I could find to channel the flux of images and emotions rising within me. 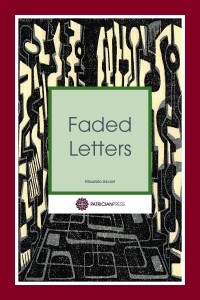 The result is Faded Letters, a hybrid between the family memoir and the novel. A text that is rooted in real facts, notably, tracing the fate of Antonio Ascari, who was deported to Germany in 1944 as a forced labourer and died in Lublin in 1945, while fleeing from Germany with other Italian prisoners. This removal instigated by politicians is accompanied by a lack of concern in the academic world and commercial publishing. I believe that forced labour needs to be reassessed in the light of the recent developments in globalisation, when the world risks being governed by a new overarching principle – the laws of economy, which nobody dares question. The deportation of forced labourers – ‘Hitler’s slaves’ – was precisely aimed to guarantee the good functioning of the German war economy. After being abducted and thrown into Germany’s concentrationary universe, these human beings became cogs in the productive machine. Twenty million people – from almost every country in Europe – carried out forced labor for Nazi Germany in the German Reich as well as in the countries occupied or controlled by the Germans. The work extorted from these people was indispensable for the German war effort and moreover helped to ensure the living standards of the German population during the war years. The German “master race” granted itself the right to exploit those it had subjugated and members of allegedly “inferior races” with all its ruthlessness. Millions and millions of people were deported to Germany as forced labourers. Many of these, however, never came home. Also because many of these forced labourers were systematically underfed and consequently died of starvation or illness. I am a teacher. I have been studying with growing passion the relation between contemporary novels and past collective traumas, first of all the Holocaust. When literature and testimony merge, our emotions as well as our intellect are solicited. Words inevitably translate into ethical statements and call into question both the author’s and the readers’ ethical positioning. Our psyche becomes inhabited by powerful energies which we cannot fully control, but which make us what we are. We feel we are treading on delicate, sacred ground. An interesting aspect of the current fictional reappraisal of the Holocaust – and more generally of European history at the time of World War Two – is the fact that several authors are too young to have lived through these events, but often inherit trauma from parents and grandparents. This particular brand of fiction was famously labelled by Marianne Hirsch as post-memory, a sub-genre which includes Jonathan Safran Foer’s Everything is Illuminated (2002), Marcus Zusak’s The Book Thief (2007) and Helena Janeczek’s Le rondini di Montecassino (The Swallows of Montecassino, 2010). Foer was born in Washington in 1977, but his mother was the child of Holocaust survivors; Zusak was born in Sydney in 1975 to a German mother and an Austrian father; Helena Janeczek’s was born in Munich in 1964 to a family of Polish Jews, and moved to Italy in 1983. In October 2010, a few months after Janeczek’s book appeared, I was preparing a talk on history in contemporary novels. I was fascinated by post-memory texts such as Art Spiegelman’s graphic novel Maus: A Survivor’s Tale (1991), where the author interviews his father, a Jew of Polish origin, who survived the camps. It was only after this that I dared approach a book which I had always found daunting, Primo Levi’s Se questo è un uomo (If This Is a Man, 1947). Levi’s novel was a revelation, a punch in the stomach. All of a sudden, I felt the need to know more about Antonio’s fate. I immediately contacted the Istituto Storico della Resistenza (Institute for the History of Resistance) in Novara, the town where he had lived. With extreme kindness, Mauro Begozzi, Institute Director at the time, offered to do some research in the archives and also advised me to read a few historical works. Unfortunately, no traces of Antonio could be found. Begozzi explained that there are no complete lists of the Italians who were deported to Germany during World War Two. Researchers are striving precisely to assemble data and life histories. I understood that a story was asking to be told and I started reading. The desire to write this book was like an illness. Perhaps the effort to live – or re-live – all this was so demanding and overpowering that I had no energies left to live my real life. During those days I read and wrote from morning until night, thanks to the silent complicity of my wife, who left me in this state of trance without questioning what I was doing. While I was recounting the fate of Antonio – his deportation and death in Lublin – not for ‘racial’ motives, but rather for economic reasons, a nexus hit me. I could not discuss his experience and that of the other members of his family without setting it against a wider background. A totalitarian regime shapes the lives of citizens, starting from their youth. Conforming to an ideological standard, it engenders loyalty also by exerting forms of aesthetic fascination. Propaganda manipulates people’s thoughts and emotions, progressively reducing the ideological and ethical alternatives, the lifestyles, the private space (as traditionally marked by individual freedom). It labels what is different as inferior and deviant, fostering a rhetoric at the core of which is the enemy – be it internal or external. To eliminate Jews from the Fascist State, it was first necessary to sever the network of relations that connected them to the rest of society. In November 1938 the Fascist regime approved a set of racial laws which confined Jews to a marginal territory within society, setting the ground for their disappearance. Jewish children were excluded from schools; adults were prevented from exerting their professions freely or from participating in public life. To restore symbolically the ties and connections that Fascism aimed to dissolve, in my narrative a Jewish friend is close to Antonio in his last few days. I believe in the cathartic power of words, in their therapeutic dimension, in words as an event. The final part of this narrative is a ritual, an attempt to work through distant bereavement that relies on reciprocal recognition between Jews and non-Jews. This mutual recognition is meant to symbolise, that is to say reconnect, what the regime had diabolically divided. Two kinds of contrasting music appear within these pages. On the one hand, the music of the regime, made up of triumphal songs and slogans – Credere. Obbedire. Combattere. BELIEVE. OBEY. FIGHT. This music, like the sirens’ song, seduces you, depriving you of your conscience, of your individual responsibility, and ultimately leads to death. Suffice it to think of the Fascist’s manipulative rhetoric of self-sacrifice in the name of the country, and of the related rhetorical construction of the enemy, which was encapsulated in the Fascist motto, Many enemies, much honour. While propaganda addresses its jingles to the masses in order to encourage conformist behaviour, another kind of music resonates within the pages of the book – an inner music which marks each individual as unique. What happens to this music when external circumstances reduce the space of individual agency? War and incarceration bring humans back to an animal state, reducing them to their primary needs, but humans resist privations, oppression and suffering. They resurrect in empathy. They flee from prisons thanks to their imagination. 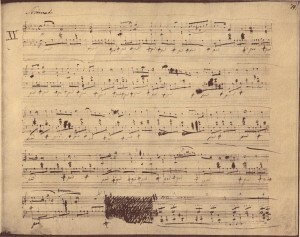 To investigate this mysterious energy I chose Chopin’s “Raindrop Prelude” (Op. 28, No. 15). Legend has it that Chopin was inspired to write this after dreaming of drowning and that a raindrop kept falling on his breath. This raindrop entered my story. I read it as the musical rendering of a psychic core which is both delicate and tenacious, which vibrates when humans come into contact and which some may call soul. The music of the soul. The well-being, the freedom, the future of a mountaineer who is lost in the gorges of the Apennines depend not only on the state of well-being or poverty in which the inhabitants of his village find themselves, depend not only on the general conditions of the Italian people, but depend also on the conditions of workers in America or in Australia, on the discovery that is made by a Swedish scientist, on the moral and the material conditions of the Chinese, on war or peace in Africa. Briefly, they depend on all the huge and small circumstances that in every part of the world act upon a single human being. This holistic idea of total interdependence inspired me to conceive the book as a large fresco written in the attempt to render the complexity of an epoch. Thus, in the original versions of this volume the story of Antonio and of his family intertwined with various other narrative threads, ranging from the history of Fascist Italy (including the progressive grip the Fascist State had on the education system so as to mould future party members) to the international political scenario. In particular the novel was aimed to demonstrate the proximity between Jewish and non-Jewish characters, by intertwining the life history of Antonio with that of Guido Horn D’Arturo. Born in Trieste in 1879, then under Austrian rule, Guido Horn chose to fight on the side of Italy during World War One and even changed his family name, adding D’Arturo to it. He was someone who believed in Italy as the product of the Risorgimento movement. 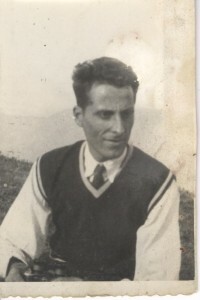 In the aftermath of the conflict Guido – who was an astronomer – obtained a post at the University of Bologna and in 1936 he even created an observatory in Loiano, the small town in the Apennines where Antonio had grown up. 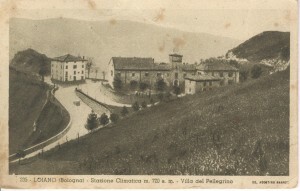 The Horn archives still include letters testifying to the fact that while the observatory was under construction Horn lodged in the hotel that belonged to Antonio’s family, the building that can be seen on the left hand side of this postcard. Troubles began for Horn in 1938, when because of the racial laws he was forced to abandon his post. In the original version of my novel I followed Guido in his ups and downs, through his successes and defeats, until after the war he came back to his observatory. Like Bepi, the painter who still features in the text, Guido, the astronomer, was conceived as an observer. I meant to use the sense of sight as a symbol of rationality and distance from events. Yet, when I started showing my text to friends, colleagues and publishers, this multifaceted approach to history was generally deemed distracting, for it detracted interest from the protagonist, dispersing the readers’ energy into a thousand rivulets. As a result I decided to limit the scope of the book to the life history of Antonio and of his family. The result is Faded Letters, the English edition of a book originally entitled La pagina cancellata. I wrote several proposals, but no Italian publisher wanted to take a chance on this novel. So I started over again. I translated a sample chapter into English, I sent it to agents and publishers on both shores of the Atlantic, and then the miracle happened! Patricia Borlenghi of Patrician Press answered my message telling me that she was interested in the text. This marked the beginning of a new episode in my adventures. After writing and rewriting, it was time for translating, and then rewriting began once again, but in a different language, which I did not master completely. This made me discover – or better re-discover – how important friends are and that joint ventures and common efforts can effect what a single individual would never be able to achieve. This is one of the many gifts I received from the experience of writing this book. I would like this exchange to be an ongoing process. Therefore, I would be grateful if readers shared their comments with me… Please, let me know what you think of the subjects I have addressed and how they are tackled in the book. See Brunello Mantelli, “Gli italiani in Germania 1938-1945: un universo ricco di sfumature”, quaderni Istrevi, 1 (2006), p. 19. 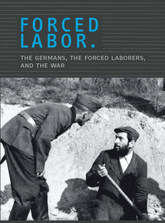 Volkhard Knigge, Rikola-Gunnar Lüttengau, Jens-Christian Wagner, Introduction to Forced Labor: The Germans, the Forced Laborers, and the War, Companion Volume to the Exhibition, Weimar: The Buchenwald and Mittelbau-Dora Memorials Foundation, 2010, p. 6. See Marianne Hirsch, “The Generation of Postmemory”, Poetics Today 29.1 (Spring 2008), pp. 103–28; by the same author see also Family Frames: Photography, Narrative and Postmemory, Cambridge, MA: Harvard University Press, 1997.